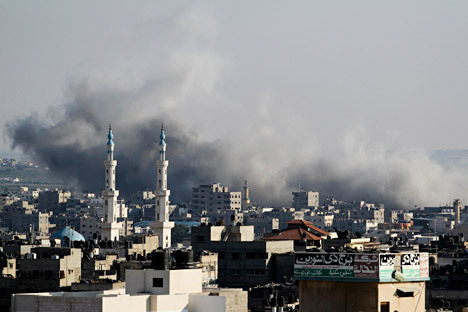 RIR interviews residents of Israel and the Gaza Strip, trying to understand how the war has affected their lives. Israel has a Russian Diaspora that is estimated to be number around one million. Many Russians living in the country have mixed emotions about the war between Israel and Hamas in Gaza. RIR spoke to a few Russian residents of the troubled region to get some fresh perspective on the crisis. She says that a couple of weeks ago a lone soldier, whose family lives abroad, died in Gaza. The victim's friends wrote on Facebook that his parents would not be able to arrive in time for his funeral and it is possible that no one would come to part with the soldier who had given his life for his country. As a result, 30,000 people came to his funeral the following day, people who had never even met him. According to Samoilova's stories, Israelis who live in the south have a completely different sensation of the war. They have to sleep with their families in bomb shelters, having gathered the family members 15 seconds before an enemy shell explodes above their heads. The young lady says that support can be felt coming from everywhere. Last week she met three Italians in a bar, who, in her words, had come to Israel in a time of war in order to show their fellow countrymen that life in Israel is continuing and that not everything is as awful as mass media depicts it. She notes that 250,000 people were forced to leave their homes: their abodes were partially or totally destroyed. In her words, the villages bordering Israel were almost entirely wiped out and people are moving to the country's central regions, trying to save their lives.